Am taking off from Washington DC’s Dulles Airport in less than 11 hours. 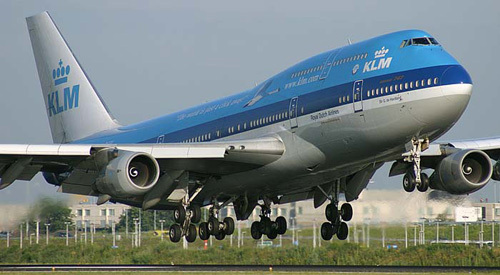 KLM is now charging extra for any seat that isn’t one of those nasty ones in the center of a five-seat row. I paid $41 more for a window seat on a two-seat row with no one else next to me. There were 30 more open seats, so keeping fingers crossed that the flight doesn’t fill up and I can spread out and get comfy. Laying over at Schiphol for a few hours tomorrow, which is my favorite European airport of all the ones I’ve been through on the last three trips to India. Then a shorter layover at Delhi before catching JetKonnect to Udaipur at the crack of dawn Sunday morning. It’s been an unusually cold, gray and miserable winter this year in the Washington D.C. area. Temperatures have been well below normal, and we just had a big snowstorm that closed down everything along with a blast of particularly icy temperatures that has hung around for the last two weeks. What has kept me cheerful throughout all of this is knowing that a week from today, I’ll be back in Udaipur, surrounded by my dudes. 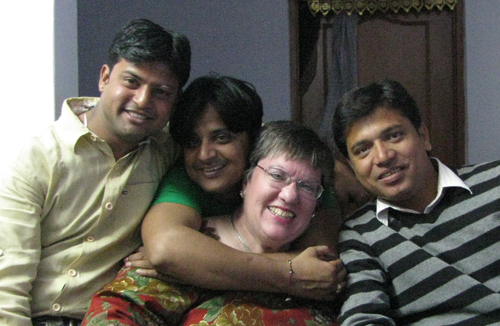 We’ve been Skyping most weekends since I left in June, and we’re all excited that I’ll be back in only a few days. The weather in Udaipur is perfect this time of year. Days are sunny and warm, not yet hot. Nights are a little chilly, but good for sleeping. It’s springlike weather in the middle of winter. This time I’m looking forward to visiting the Bagore Ki Haveli Museum and seeing its dance performance, which I’ve read only good things about. 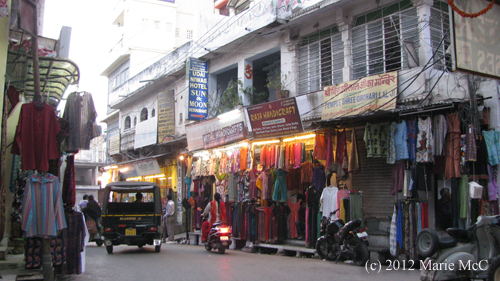 Am eager to visit the Bharatiya Lok Kala folk art museum and see its puppet show. 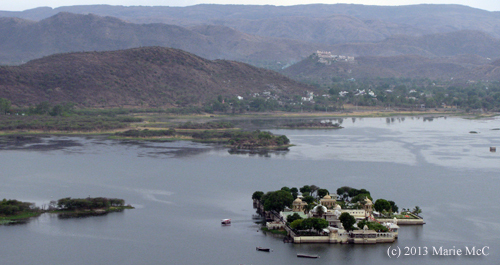 And my dudes and I will make the trip up the mountain to Sajjangarh, also known as the Monsoon Palace. I’d like to go up the Karni Mata Ropeway again. Who can get enough of vistas like this? We’ll be returning to Zannat, our special rooftop restaurant with the heartstopping view of Fateh Sagar Lake and the Aravalli Hills. There are a few restaurants I’ve just heard about that I want to go to such as Ambrai and Upre, both of them located in Naga Nagri with spectacular lakeside views of the old city, and Natraj, which serves traditional Rajasthani fare. I found out about them after reading Highway on My Plate, a great guide to Indian restaurants. 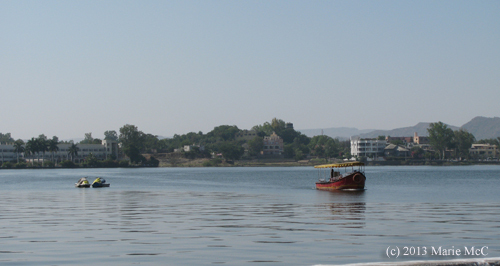 All year long, my thoughts drift back to Udaipur. 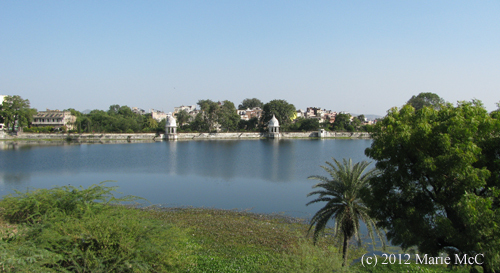 So many people visit Udaipur only for a few days, but they spend half their time going on day trips to places outside the city like Ranakpur, Eklingi and even Chittorgarh. I don’t get it. 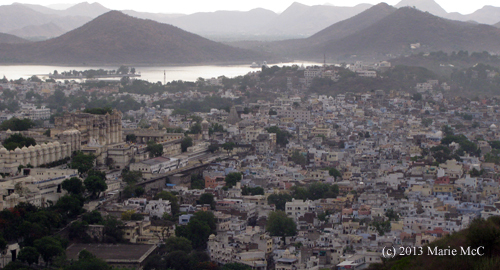 There’s so much to do and see right here that a few days doesn’t give anyone enough time just for Udaipur itself. I’ve been there three times, and I’ve just barely scratched the surface. Seriously, the Udaipur Tourism Board should hire me. Udaipur is such a magical and beautiful place. There’s no place I’d rather be to escape from winter for a few weeks. 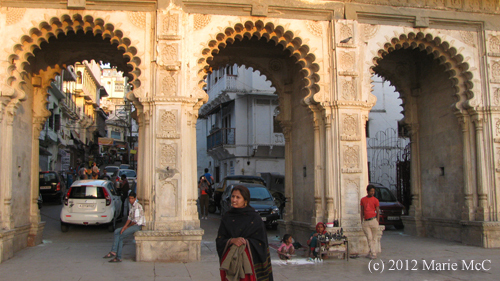 This entry was posted on January 26, 2014, in India, Udaipur.